The not-often profound musings of a Washington writer and doctoral student. I sure wish we could make money from fanfic, ’cause if that were the case I’d be sitting on a cool million by this point. One story alone has generated 180-thousand hits. Alas, there’s that whole copyright infringement, yada, yada, yada. Open Water from Bella Books. But, that said, I do have a book published. I am teaching my students “persuasion” at this point in the semester and the thing I emphasize most (after ‘ethical appeals’) is for them to not forget the “ask.” What is it you want your audience to think, do, or say at the end of their persuasive speech? Then, in the shower this morning as I was trying to figure out which to pay: mortgage or hospital bills, it came to me. So, now I am asking. 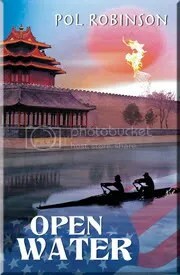 If you have not done so, please buy my book, Open Water, available here: Bella Books. If you’ve already purchased a copy, consider buying another to give to a friend. Or two and donating one to either a local library or a local gay/lesbian center. If you’re uncertain, you can read an excerpt on my web page, here: Open Water excerpt. If you are at all concerned about the “lesbian-ness” of the book, let me assure you that this book is by no means a “how-to” manual. Believe me, I was absolutely aware that my younger cousins would be reading this (as would be my multitudes of parents). And one such parent, this one a very conservative (“I live in McCain Country,” Florida) step-mom, said, “Wow, this is quite good! I actually couldn’t put it down!” High praise indeed from a Obama-wasn’t-born-here conservative. Thus, keeping in mind what I have often told my students on the think/do/say plan, I would like you to think about what you can afford, buy the book, and tell others to do the same. If you buy the e-version, you can get it “Kindle-graphed,” or you can drop me a note via my Facebook page and I will send you a personalized book plate. I just want to give you a shout-out for your book. It’s REALLY good! I couldn’t put it down and then I gave it to Jon who still hasn’t given it back. So I think I’ll buy a few more. I like your ideas about donating a copy to the library or sending copies to friends. It really is a page-turner and more folks need the chance to read it.